I dusted off my barely-there CAD designing skills I picked up last year to start things off. I fiddled with the 3D modeling to make an inverse of the brick mold. And since I’m fortunate enough to have a husband who likes to 3D print things, he fired up our MakerBot and printed up a lovely hard plastic form for me to work with. I chose a paint on rubber (Mold Builder by Castin Craft) to make the mold with, which indicated carefully painting 11 coats of rubber onto what you want to make a mold of. The only problem was that each coat needed at least 6 hours to dry, and preferably 12. So if you add to that the fact that I just did a coat whenever I had time, it took me several weeks a month to get the mold finished. Despite the long time lapse, the rubber captured detail better than expected and it’s lasted well through regular use. As I was making the mold I did some research into what types of material to use to make the bricks. I ended up deciding on plaster of Paris as it sets quickly (under an hour), is easy to clean up, and pretty cheap. I also have fond memories of making Richard Scarry molds with it as a child. My backup option was to be cement since Plaster of Paris isn’t waterproof (it might melt in the rain), but in this case, it wasn’t a big concern. One of the things you have to be careful of when doing any sort of casting is the dreaded air bubble. If you don’t get those suckers out before your medium sets you have holes in your beautiful cast. I ended up going with the tried-and-true (as well as free) method of just tapping the mold until air bubbles stopped coming to the surface. But if you’re going to be making a lot of bricks you might consider a cheap vacuum degassing rig – basically a shatterproof vacuum jar and a vacuum pump to force the air bubbles to rise to the surface. I ended up spending a lovely evening playing around with iMovie to share my method for brick making. Wanna see? If you want to tackle a project like this, you’ll need a few materials. I bought my first box of plaster of Paris at Michael’s but heard a rumor that you can find it in the paint section at hardware stores. Turns out it was half the price! I also used popsicle sticks and plastic cups so I could dispose of them. It ends up being more garbage in the landfill than I’d like, but I heard that plaster of Paris will clog up your drains if you rinse the extras down the sink. Yikes. The materials above let me make around 325 bricks before I had to stop in at the store for more plaster of Paris. The cement coloring was only about 1/4 used, so I’m guessing it would be good for around 1300 bricks. Have questions? Just comment below and I’ll get back to you. Happy brick making! Can you give me the link or file so i can 3d print it and make the mold? Thanks for writing in, Martin! I’ve updated the tutorial to include the STL file. Happy brick making! I’m looking to make a 3d print Mold for Mini cement cinder blocks, could you help? I currently have a mold already but it’s only for 4 bricks. I would like to mass produce but would like molds that hold around 12, 16, or 20 bricks each mold, or something like that. Thank you. Good to hear from you, Manuel! I’m the wrong person to ask about making you a mold since I’m a newbie to CAD. I learned enough to get the job done by going through the Onshape video tutorials. Thank you after searching for mold I came across this mold for a 1/6 brick and then I saw your video. Thank you not only is it the perfect sized brick you have (and shown) it’s easy and what I wanted. You have all the steps plus all the helpful hints and hacks to make a set of perfectly sized bricks and made the steps so easy. I plan to make 1200 bricks so all I have to change is adding 4 times the plaster to make all my bricks. Thank you for making such s great video. I’m making a rather large diorama 1/6 with 12″ GI.Joes. It’s 14′ running feet fir my French tien and battle scene. Hi Jeffrey – sorry it took me so long to respond! I’m so pleased that this might be a good solution for your bricks. I did a lot of searching online as well to try and find the best way to make them before deciding to try a mould. Since this tutorial I’ve also made a few moulds with Smooth On Liquid Rubber (PMC 121/30) and found that it’s faster than the paint-on mould shown in this tutorial, because it’s a pour-and-set rubber. Please do send a photo of your diorama when you get it done – I’d love to see! I would love to see what you used these awesome bricks for! Do you have any posts of the final project for which you used them? I couldn’t find it. Mar, I feel so honored that you went looking for my project! I would have been blown away if you found it online because my future self would have had to post it. The plan for these bricks was to make a 1:6 scale living room with brick walls, but this project has been on the backburner for quite a while now. 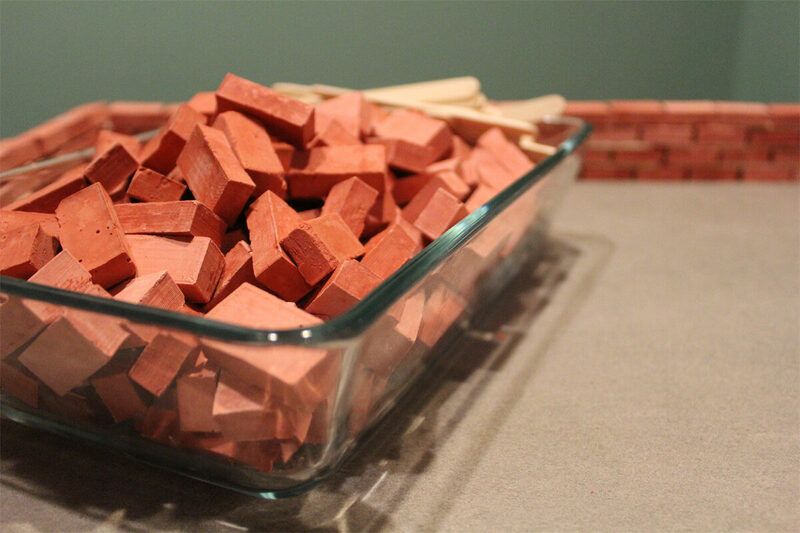 I made about 500 bricks with this method and then did the calculations and realized I needed to make another 500 or so. So discouraging! But I’ll be sure to flip you a note when I have something to show. Thanks for checking in! Previous Previous post: Where’s Waldo on Canada Day?